A recent scientific breakthrough in Japan has balding men of the world beelining to the nearest McDonald's. Researchers at Yokohama National University succeeded in regrowing hair on mice using "hair follicle germs" (or HFGs) along with polydimethylsiloxane (PDMS), a chemical used in Mickey D's cooking oil. However, the connection between your average male pattern baldness and greasy fast-food fries is tenuous at best. Yet many balding hopefuls are excited about the idea of drive-thru follicle-stimulation. This "scientific breakthrough" is cruising through the information highway like wildfire such that headlines like "McDonald's French Fries May Cure Baldness" are starting to take on the definitive, "Do McDonald's Fries Cure Baldness? 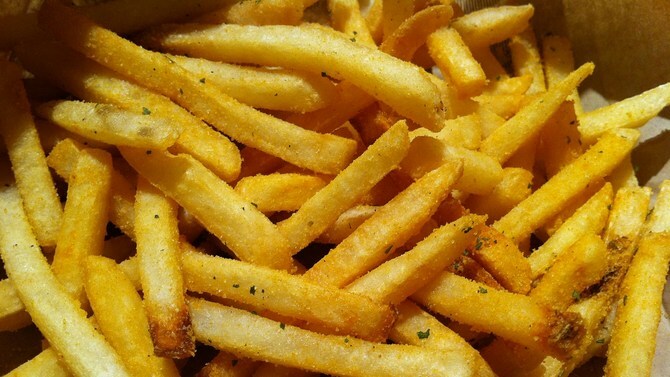 Science Suggests Bathing In A Tub Of Fries." Slow your roll. Fries curing baldness is worth being a little skeptical. PDMS, the hair-loss antidote in question, can be found in many things outside of McDonald's ingredients list. Grub Street cited many non-consumable items also containing PDMS: "adhesives, caulks, cosmetics, some gas-relief medicines" and Silly Putty. But, despite its barely food-like qualities, the FDA states PDMS isn't dangerous to consume. McDonald's writes on its website that they use PMDS to reduce oil splatter when cooking its "World Famous Fries." Nevertheless, Japanese scientists found another use for this additive. Writing in the journal Biomaterials, the Yokohama University team explained the key to the experiment's success was the choice of substrate material, in this case, PMDS. Producing HFGs in large quantities is difficult but critical in hair regenerative medicine, but the Mickey D elixir proves to be a promising medium in which these germs can grow. So, to be clear, McDonald's fries themselves do not trigger hair growth and bathing in a tub of fries and vegetable oil will not put you in the fast track to luscious locks. PMDS simply helps move the hair-growing process along … in mice. But researchers at the Japanese university are hopeful of this method, calling it "very robust and promising" in improving hair loss treatments for humans using toupees and wigs. Whether or not this scientific breakthrough bridges man's receding hairline, it is exciting and frightening that we have found a way to grow hair on mice and mix gas-relief medicine in fast-food oil.